Squad Boyle was a pretty late addition to my Sin Eaters army. They nonetheless got used in a tournament or two as well as in a number of casual games. My income levels at the time were pretty low (a perennial condition at sho3box towers Im afraid) and so I used a few components that up until that point I had been avoiding, in the interests of keeping things cheap. Most notably in that regard was the use of the quite goofy zombie head with the beard and the tongue hanging out from the GW zombie sprue. For the earlier squads I had avoided that head as I regarded it as a bit too wacky for my purposes. Finances were low and I had a number of those heads sitting around so I decided to use one along with the new-at-the-time Space Wolf heads (and a Khorne head). At that late stage of painting an army (roughly about 80 models or so into the project I would say) painting techniques tend to have evolved, usually in the interests of expediency. In addition to that slighly more oddball units and concepts start to crop up, usually in my case in an effort to keep interest up. 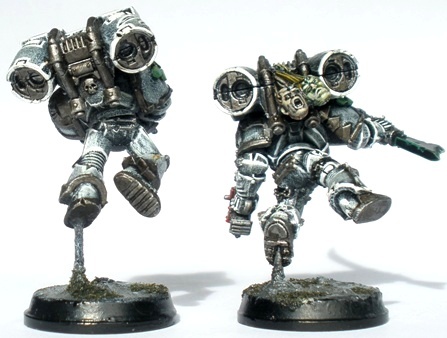 Hence the heavily armed unit of jet pack-ing zombie space soldiers. There has been some crazy talk about playing some small games of 3rd ed 40K amongst SOS and MT recently. If my resolve breaks and I engage in some of those shenanigans it will likely involve games that include the more elite and oddball units like Squad Boyle. 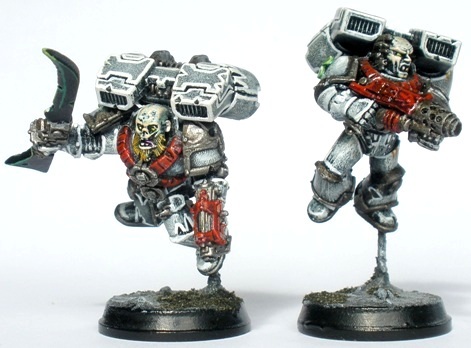 I don’t know much about W40K, but I do love nicely painted minis like these. They look battle-weary. Great job! Thanks for the feedback apeekaboo! Squad Boyle represents the final stages of my painting technique for that army, after a couple of years of development. 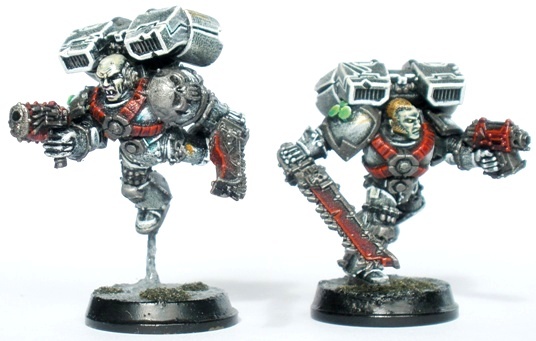 They can probably be seen as the upper technical limit that I am willing to paint at on a squad level, if that makes any sense (the most reasonable compromise between quality and time-taken, that is). That does actually make a lot of sense. I’m still developing my painting skills, trying to find my current sweet spot for ‘good enough painting, but not too much time invested’. I could double the time invested for painting each mini but still get only 10% better result. Not worth it in my opinion. This has always been a challenge for me to stop doing something when it’s good enough, but not necessarily perfected. Finding the point at which the returns have diminished so much as to render further work redundant was a distinct goal in my miniature painting for the last few years. After painting figures to progressively higher standards for twenty years I went right back to bare bones base coats and washes/dips for a couple of years. The standard dropped but my output increased by something like a factor of four. 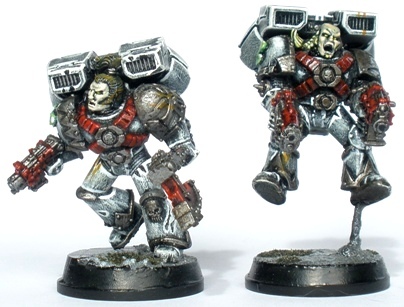 The figures painted during that period (many of them feature in the earlier posts on this blog) are not as individually nice to look at but are easily adequate to game with. After painting to that standard for 18 months or so more detailed processes started to creep in, adding time but increasing my satisfaction with the work done. I learned some things by paring the process back to basics plus I learned to paint a little faster. I think that I have reached a sweet spot that suits me, where the final product is good enough to satisfy me while not taking a cripplingly long time to achieve. I am glad to hear that you have made some progress with your technique. I look forward to seeing some photos soon.